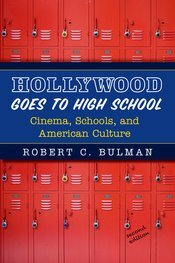 "Beautifully written and engaging, Hollywood Goes to High School unmasks the cultural tales that Americans tell themselves about themselves. Bulman shows how Hollywood films project a congratulatory middle-class mythology of progress, universalism, and heroism, simultaneously obscuring and revealing deep and destructive class divisions. This is sociology at its best!" "Movies about high school are as ubiquitous as they are unexamined. Robert Bulman has gone in search of their cultural significance, and come back with a smart, nuanced, accessible book. With sociological rigor and the sensitivities of a moviegoer, Bulman demonstrates how these films are part of a complex cultural processing of social differences—social class, in particular. Hollywood Goes to High School is an important—and fun—addition to the study of contemporary culture." "In applying sociological analysis to movies these students hold dear and to which they have attached an enormous amount of affection, Robert crafted a brilliant teaching tool. By conceptualizing films about high school as cultural stories, Robert effectively makes students social scientists, showing them...that they [can] examine inequality through easily accessible media like movies and television." "Once in a while a sociologist manages to write a book that is theoretically grounded, empirically sound, and generally interesting. Robert Bulman has written such a book. His Hollywood Goes to High School is both thoroughly enjoyable and insightfully sociological. Few books manage to be both and for that reason alone Hollywood Goes to High School should be recommended if not required reading for every high school and university introductory course. Bulman has carried out a thoroughly sociological analysis that is intellectually sound, frequently insightful, and always engaging. Simply put he has accomplished the increasingly rare feat of writing a book that speaks sociologically to scholars and the lay public alike."